The Gravity Flow Form Connector Extension version 1.1 is now available via auto-update and for download from the account page. This release contains an important new step type which waits for the submission of a different form. It’s an extremely powerful step that helps reduce complexity when designing workflows by allowing fields to be offloaded onto different forms. Fewer fields on the form will result in increased performance for forms with a lot of conditional logic and especially for forms with a lot of entries. 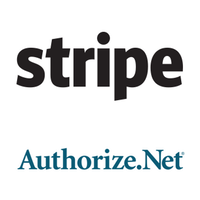 It also opens up a brand new way to integrate forms with feeds from payment add-ons, including the Stripe Add-On and the Authorize.net Add-On and also with forms that have custom or third-party fields which might be causing issues in the User Input step. The Form Submission Step holds a workflow in a pending state until an assignee submits a specific form. For example, a workflow which takes a customer through the entire process of a project right from initial requirements to final delivery may require payment steps at the beginning, middle and end. 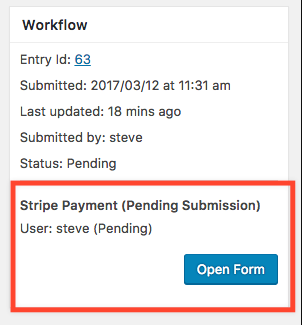 The Form Submission Step will wait until the each payment has been processed before allowing the workflow to continue to the next step. When the workflow is pending a form submission the assignee can open the form from the workflow entry detail page (the shortcode in the front-end or the admin UI) or from an assignee email. Default values for the new form can be mapped easily from the source entry and the source entry ID is secured by a special token in the URL to prevent tampering. For example, the assignee’s name, address and the product quantity fields could all be pre-filled automatically from the values in the original entry. – Added translations for Chinese (China) and Dutch (Netherlands). – Added integration with the Gravity Flow Parent-Child Forms Extension; a parent form can now be selected for the ‘Entry ID Field’ setting on the ‘Update an Entry’ step. 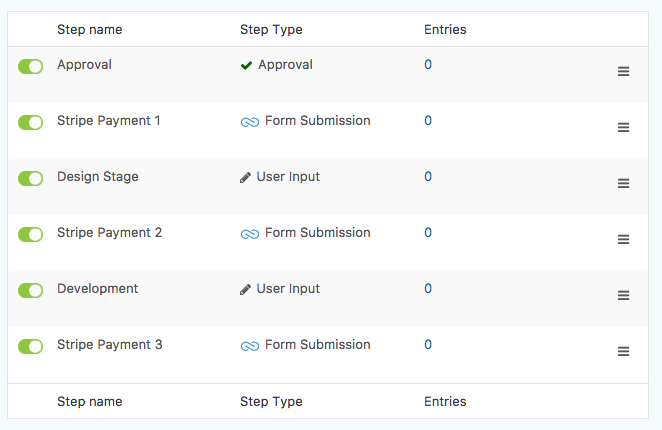 – Added the Form Submission step. – Added support for mapping the created_by field in the target entry. – Added support for merge tag processing in the custom values fields of mappings. – Fixed an issue with the value for choice based Poll, Quiz, and Survey fields in the new or updated entry. – Fixed a fatal error which could occur when using the ‘Update an Entry’ step type and the ‘Entry ID Field’ setting was not configured.